Eat your turkey leftovers, then gather up your relatives and head on over to Playhouse on Park for a night of improvised comedy. 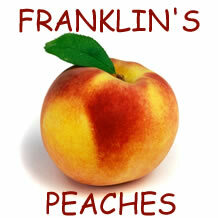 Franklin's Peaches and Friends returns to Playhouse on Park for a post-Thanksgiving night of belly laughs on Friday, November 25th. Franklin's Peaches, renowned for their confident, high-energy style, will be joined by some of Hartford's best improv artists for a one night only performance.